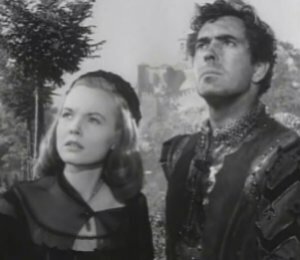 Looking around the room, his eyes settle on Andrea Orsini, played by Tyrone Power. Borgia coolly asks Orsini if he has the stomach for such a mission. Orsini replies that he has the stomach for it and the appetite. On the way to the duchy, Orsini, a painter, drops by for a visit to an art dealer, his mentor. He arranges with him to display one of his paintings. When Camilla Verano sees the painting, she admires it, whereupon Orsini offers it to her as a gift. 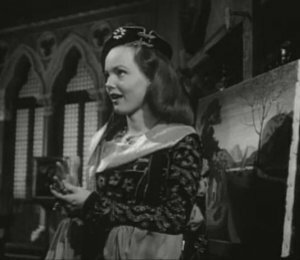 In return for the painting, she gives him a ring and invites him to visit her and the count. As it turns out, Orsini’s word to Borgia is good, and he masterfully completes the Ferrara mission, with skill, cunning, and lots of flattery. In speaking with Orsini about the successful mission, Borgia congratulates himself for choosing Orsini. 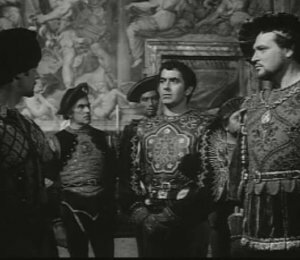 He then gives Orsini his next mission, telling him that there would be a “jewel” in it for him. The mission is to seduce Camilla Verano, wife of Count Marc Antonio Verano of the Citta del Monte, whose small duchy is Borgia's next intended conquest. 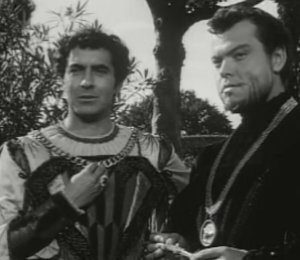 Once he has won the love of Camilla Verano and the count is out of the way, Orsini is to surrender the mountain fortress to Borgia. As the story progresses, Orsini’s emotions get in the way of his being able to carry out the mission for Borgia. He spends a few months painting Camilla’s portrait, and he becomes very fond of her. When he shows her his painting, he seems earnest with his comments to her, rather than the cunning Orsini of old. He tells her that his painting doesn’t lie. She begins to see him in a new light. He also has come to admire her husband, the Count, realizing that he is a good, decent man. Rather than continue his mission for Borgia, he betrays him, siding with Camilla and her husband, offering "one extra sword". He helps them plan a defense for their duchy. 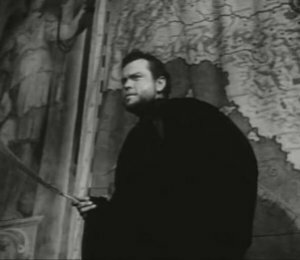 Borgia orders an attack on the mountain fortress. The Count, with Orsini’s help, leads a charge against Borgia’s troops, and the Count dies during the battle. Earlier in the story, Borgia had forewarned that he would not deal kindly with anyone who betrayed him. This forewarning comes into play with the concluding scenes of the movie.